Nathan Hartman talks to Bruce about his first visit to Disneyland—on the week it opened—his career in film and television, and scoring for theme park attractions. "MICKEY, DONALD, GOOFY - THE THREE MUSKETEERS" JUST RELEASED BY INTRADA! For the latest release from the rich catalog at Disney, Intrada presents the premiere of Bruce Broughton's score from the 2004 animated adventure, "Mickey, Donald, Goofy—The Three Musketeers." While a song album was initially released, the rollicking score had not been included. Now, some 14 years later, Intrada has enhanced the presentation to include both the songs and Broughton's extensive score, which happens to be one of Broughton's personal favorites. This new album retains the cohesiveness of the original score, in which the score flowed smoothly into the songs for a musically cohesive whole, rather than being presented with separate score and song sections. The score itself recalls an earlier time of swashbucklers, with the likes of "Adventures of Robin Hood" and "The Sea Hawk" embedded in the score's heroics. As Broughton points out in his liner notes, in order to fit the songs into the fabric of the score, their arrangement required meticulous attention. This premiere release presents the score and songs as originally intended by the composer. For more information, to listen to select tracks, and to purchase, please visit the Intrada website. This is a limited-edition release. Bruce Broughton isn't one to shy away from a compositional challenge, and this one presented itself as an intriguing orchestration puzzle: compose a piece for string quartet and symphony orchestra, taking into account that a string quartet usually performs alone lest it be overwhelmed by the symphony orchestra. As Broughton poses, "If the quartet is self-sufficient, what does the orchestra do? Next week we'll find out." On January 25th, 27th and 28th, the Lyris Quartet and the New West Symphony will premiere "Salmagundi," a piece for string quartet and orchestra, at three local venues. More information is available on the New West Symphony website. A conference for music and sound in film, games and the media, SoundTrack_Cologne is a four-day event held annually in Cologne that focuses on current developments in the culture, laws, marketing and techniques of media music. The event features round tables, panels, workshops and networking events, along with film premieres, competitions and awards ceremonies. This year, award-winning composer Bruce Broughton received the Lifetime Achievement Award as one of a handful of "Hollywood Greats" who have contributed on the highest level to the film experience. "HONEY, I BLEW UP THE KID" EXPANDS! A 1992 Disney favorite, "Honey, I Blew Up the Kid" just got expanded and revisited with several previously unreleased cues, additional shorter bits, an alternate version of the end credits, and... wait for it... the premiere release of the original score for the 1992 cartoon short, "Off His Rockers," that debuted in front of main feature. Enjoy Broughton's trademark Americana style as a wooden rocking horse becomes the focus of a young boy's imagination that gallops off into a Western adventure. This limited-edition Intrada CD is presented courtesy of Disney from two-track digital scoring session mixes composed and conducted by Bruce Broughton. Please visit the Intrada website for more information, to listen to select tracks, and to purchase. Bruce Broughton's 1991 score for Paramount's "All I want for Christmas" is now available for purchase—just in time for the holiday festivities—from Intrada. The CD presents the original score, in its entirety and mastered from the complete digital, two-track session elements. Also included is Broughton's source music, along with an instrumental arrangement of a David Foster song written for the movie. Playful, tender, heart-warming themes light up this seasonal family favorite featuring a full orchestra, conducted by Bruce Broughton, and replete with sleigh bells, glockenspiel, celesta, triangle, upper woodwinds and vibraphone. This is a limited-release Intrada Special Collection CD. For more information or to purchase, please visit the Intrada website. In collaboration with the Zaragoza Film Festival, the Film Symphony Orchestra (FSO) will be presenting Bruce Broughton with the "Oficios de cine" award for his contributions to music in film. Broughton will also be conducting the Film Symphony Orchestra in a performance of one of his most popular western scores, "Silverado." "Tombstone" will also be performed in this one night of film music at the Zaragoza Film Festival. "Something old, something new, something borrowed, something blue" opens the season for the Cal State Fullerton Bands on Sunday, October 9 from 4–6 PM. The "something new" venue will include a performance of Bruce Broughton's "Turbulence" for solo tuba and winds, with the Wind Symphony accompanying CSUF tuba professor David Holben in this premiere of a newly revised version of the piece. More information can be found on the CSUF's event page, and tickets may be purchased directly from the Cal State Fullerton website. The concert will be held at Meng Concert Hall, Cal State Fullerton, 800 N. State College Blvd., Fullerton, California 92831. On Saturday, October 8, 2016, The Lyris Quartet will premiere Bruce Broughton's string quartet, Fancies, at a Jacaranda Special Event concert in Santa Monica. The piece was inspired by Leoš Janáček's Quartet No. 2, and commissioned by the Lyris Quartet for their new CD, "Intimate Letters," which will be available at the concert. The program will also include works from the CD composed by Billy Childs, Kurt Rhode and Peter Knell. The Janáček second string quartet, also called "Intimate Letters," was inspired by the married composer's late-in-life infatuation with Kamila Stosslova, to whom he wrote hundreds of letters. The Lyris Quartet commissioned the new works to both reflect and reference the Janáček work. Information about the concert and the VIP After Party can be found on the Jacaranda website. Visit the Lyris Quartet website for more information on the "Intimate Letters" CD and the Lyris Quartet. In addition to the concert, the CD is also available for purchase (either as SACD or DSD) from Amazon.com. A fascinating project that bares the souls of six of Hollywood's most prolific film composers in their pursuit of one of the greatest composing challenges: the solo piano. As Bruce Broughton wisely quoted from another wise composer: "If you're going to write for the piano, you'd better have something to say!" The CD was released in 2015 and is available through Amazon and iTunes. Bruce Broughton and Disney theme parks have enjoyed a long and illustrious relationship, as fans of both already appreciate. Epcot's "Spaceship Earth," "Ellen's Energy Adventure" and the Circle-Vision 360° film, "O Canada!" are among the many bright Broughton themes that circulate around the park. Add to that the most recent addition, "Soarin' Around the World," the global sequel to "Soarin' Over California," originally set to a Jerry Goldsmith soundtrack. The beloved Goldsmith themes are still intact, but now feature revitalized arrangements and orchestrations by Broughton and his magic affinity for Disney. The stunning new attraction is now open at Disney's California Adventure at the Disneyland Resort in Anaheim, CA; Walt Disney World's Epcot in Orlando, FL; and Shanghai Disneyland in China (known there as "Soarin' Over the Horizon"). It's a must-see for any visit to any of these parks. For three days in London with the John Wilson Orchestra, the multi-talented Seth MacFarlane and the versatile Bruce Broughton recorded an album born of a collaboration whose wheels were set in motion two years ago when MacFarlane sang a Broughton arrangement of "Luck Be a Lady" conducted by John Williams at the Hollywood Bowl. The album includes motion-picture and Broadway favorites in new and entertaining versions that are sure to please fans of MacFarlane's performances and Broughton's orchestrations. On Sunday, July 24th at 7pm, Bruce Broughton will be taking part in "Composers & the Movies," a symposium and concert event for The Ventura Music Festival. Broughton will be presenting film clips with and without music, discussing the process of composing music to film, and will premiere a live sextet arrangement of music from his score to Homeward Bound. The program will be held at Ventura College Performing Arts Center in Ventura. For more information on the Festival and to purchase tickets, pleave visit the Ventura Music Festival website. When first released by the Walt Disney label in 1996, "Homeward Bound II," with only 35 minutes of the film's actual music, represented only half of Bruce Broughton's original score. Broughton recalled: "I had themes set up from the first picture, but they didn't always fit so snugly for the second. Primarily it was the scope of the film that influenced the way the music went. The first film took place mostly outdoors and the music, like the scenery, was bigger in scope, and more dramatic. It also had at times a bit of a country feeling. For the sequel, the locations were more congested with urban neighborhoods, streets, alleys, cars, vans and people everywhere. There was also a romance, so the music had a slightly different feeling, even when the original themes were used. The original film focused more on the personalities of the three animals, whereas the sequel focused a lot on the situations they found themselves in." In this latest release by Intrada, all the original cues have been restored from the original 2" 24-track recording session masters made by Armin Steiner at Paramount Pictures Scoring Stage M in February 1996 and made available by the Walt Disney Company. For a complete track list, samples, artwork, and to purchase, please visit the Intrada website. This limited-edition Special Collection release will be available only while supply lasts. L.A. PHIL BRASS PERFORMS BROUGHTON'S "FANFARES, MARCHES, HYMNS & FINALE"
Flair and imagination are at the heart of this special chamber music program to be performed at the spectacular Walt Disney Concert Hall by the Los Angeles Philharmonic's brass section. Works from different eras will be featured, concluding with Broughton's Fanfares and culminating with Broughton's Finale. For more information and to purchase tickets, please visit the LA Phil website. "Monster Squad" & "Lost in Space" Now Available! The latest Bruce Broughton CDs to become available through Intrada are Monster Squad, featuring a rich and powerful score meticulously remastered from the original tapes and released with additional tracks, alternate cues, source music and liner notes by Film Music Magazine's Daniel Schweiger; and the action-packed Lost in Space soundtrack, featuring the Sinfonia of London under Broughton's deft baton in a special 2-CD limited-edition release. THE CHICAGO SYMPHONY ORCHESTRA PRESENTS "SILVERADO"
Enjoy Bruce Broughton's bold and brassy Oscar-nominated score to "Silverado" as it's played alongside this all-time great western by the Chicago Symphony Orchestra. All ticketholders are free to attend a preconcert lecture with the composer Broughton and the conductor, Richard Kaufman. For more information and to purchase tickets, please visit the Chicago Symphony Orchestra website. UCLA Venue to Include "Tent Meeting Revival with Hallelujah Windup"
The UCLA Wind Ensemble, conducted by Trevor J. Cross, will be performing Bruce Broughton's "Tent Meeting Revival with Hallelujah Windup" featuring euphonium soloist Josiah Morales. This will be the first time Broughton's new work will be performed in public on the west coast. Tickets are available through the UCLA School of Music website. A Walt Disney Pictures classic with an early Broughton score has been restored to its entirety from the two-track, digital-stereo session masters pristinely preserved in the Disney vault since the 1992 recording session at 20th Century Fox. Originally released as a 30-minute CD, this newly minted 70-minute version by Intrada includes many of the previously omitted sequences that add up to a full and ebullient listening experience. Also included are liner notes by Jeff Bond and a flipper-style booklet of Joe Sikoryak's colorful graphics. Bruce Broughton conducts. For more information, track samples and artwork, or to purchase, please visit the Intrada website. This limited-edition Special Collection release will be available only while supply lasts. Last week's announcement of the Emmy nominations has recognized the collaborative effort of Bruce Broughton and John Debney in the main-title theme music category—specifically, Outstanding Original Main Title Theme Music—for "Texas Rising," which has received ample accolades from the U.S. to the U.K. This will be Broughton's 24th Emmy nomination. He's won 10. The 67th Primetime Emmy Awards will air on September 20th on FOX. The music awards, which are part of the Creative Arts Emmys show, will air on September 19th on FXX. Bruce Broughton's Fanfare for 16 Horns will premiere as the opening for the Hollywood Bowl's Hail, the Mighty Horn! program, Tuesday, August 4, 2015. The co-commission between the Los Angeles Philharmonic and the International Horn Symposium will feature the horn sections of the Los Angeles Philharmonic, the New York Philharmonic, the American Horn Quartet, half of the Berlin Philharmonic's horn section and two other stellar performers. The concert, also featuring horn virtuosi Andrew Bain, Stefan Dohr, Timothy Jones and Sarah Willis in Schumann's Knozertstück, will include Strauss' Rosenkavalier Suite and Till Eulenspiegel. The concert will be conducted by James Gaffigan. Concert information can be found at the Hollywood Bowl website. July, 2015—With "Back in Time" as the theme for this season's closing celebration at the FIMUCITÉ 9; Festival in Spain, a number of memorable scores have been selected to culminate a year of outstanding film music, among them such "timeless" classics as "Back to the Future," "The Goonies," "Legend," and "The Color Purple." 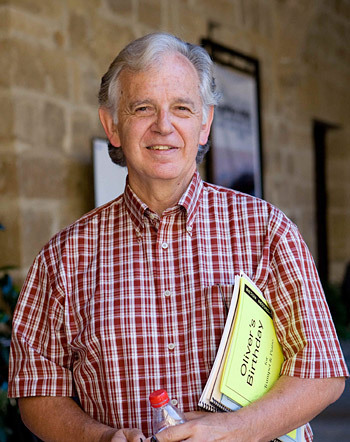 Composer Bruce Broughton will be conducting his two featured works and fan favorites, "Silverado" and "Young Sherlock Holmes," to be performed by the Orquesta Sinfónica de Tenerife at the closing gala concert of the week-long festival held from July 3 to July 11. The "Texas Rising Suite"—a collaboration between veteran composers and friends Bruce Broughton and John Debney, will see its world premiere by the Oakland East Bay Symphony during its "Independence Eve Celebration" concert, July 3, 2015. The suite comprises many of the themes, large and small, from the History Channel's 10-Hour miniseries, "Texas Rising," a retelling of the war for Texan independence from Mexico in 1836. This annual event is free to the public. Please visit the Oakland East Bay Symphony website for more details. Touted to be a "standout concert" at the Maestranza Concert Hall in Seville, Spain, the July 2nd venue is both the finale of the University of Seville's Academic year. as well a celebration of Bruce Broughton's superlative career as a composer for film, television, theme parks and the concert hall. Under Broughton's baton, the Royal Symphony Orchestra of Seville will perform a program of prominent works from some of the most memorable family and adventure movies and television series of all time. The Concert will feature the world premier of Broughton's Homeward Bound and the European premieres of his Harry and the Hendersons and Heart of Darkness. Young Sherlock Holmes, Themes from Silverado, Tombstone, The Last Samurai, The First Knight and Starship Troopers round out this robust lineup that will also include some of Broughton's theme-park music which is heard far more often than it's credited. More concert details can be found on the concert hall's official website. Information about ticket purchase is available as a pdf on the Media Screen Music website. On July 17th at 5:30pm, Gene Pokorny, principal tuba player for the Chicago Symphony Orchestra, and pianist Patrick Godon will take the stage for an intimate recital featuring works written and arranged for tuba. The hour-long program will feature Bruce Broughton's 2011 composition "Turbulence." for tuba and piano. CONCERT GOES BACK IN TIME... TO 1985! Celebrating the 30th anniversary of some of the greatest movie scores ever written, Varèse Sarabande, the Golden State Pops Orchestra and the GSPO Chorale travel "Back in Time" to celebrate with an all-star guest roster of composers, conductors and soloists. Among the many film favorites from 1985 to be performed, composer Bruce Broughton will be conducting his acclaimed score for "Silverado." Tickets are still available through the GSPO website. Premiering May 25th at 9 p.m. ET/PT, History's Texas Rising features a bounty of music behind 10 hours of fighting for Texan independence. Esteemed composers Bruce Broughton and John Debney provide "stunning and evocative" instrumentals, while the vocal talents of José Feliciano and actors/singers Kris Kristofferson and George Strait duly impart the authenticity and raw emotions that ride shotgun with the violent struggle. The movie portrays the stories of Sam Houston (Bill Paxton), Santa Anna (Olivier Martinez) and the original "Yellow Rose of Texas" Emily West (Cynthia Addai-Robinson) in the fight for Texas' independence from Mexico. A soundtrack album has been released by Universal Music Group Nashville and is available for purchase at Amazon in MP3 format. Texas Rising airs on the History Channel at 9pm, May 25, May 26, June 1, June 8 and June 15. A film score favorite since the movie release in 1985, Bruce Broughton's complete music notation for "Silverado" has been masterfully reproduced by Omni Music Publishing in a beautiful, 252-page soft-bound book available for purchase. Taken directly from Broughton's original hand-written manuscript, this one-of-a-kind compilation is accompanied by detailed analyses of major themes, along with descriptions of key dramatic scenes. Click here to view sample pages and book contents. Click here to order directly from Omni Music Publishing. Bruce Broughton's "Concerto for Violoncello and Ten Instruments" will be premiered on March 14, 2015, by cellist Andrew Schulman, for whom the music was composed. The concert, A Charged Embrace, is part of the Jacaranda Music Series. For more information, please contact the Jacaranda Group. "The music is precious, coming straight from the composers' innermost souls...with no movie director looking over their shoulders! And solo piano music shows just about everything about a composer—literally no bells or whistles. I am so moved and privileged to have this music from their private selves, and I am eager to share it with the world," is how solo pianist Gloria Cheng describes the motivation behind Montage, a recording and documentary film featuring works composed for her by six of the most sought-after film-music composers, among them Bruce Broughton's "Five Pieces for Piano." For Cheng, it's revealing the composer's truest voice through the medium of solo piano that has inspired this unique compilation. The Montage CD is available for purchase on Amazon. The sheet music for Five Pieces for Piano is published and available for purchase by Brubel Music. View the teaser featuring Bruce Broughton and Gloria Cheng. The Black Dyke Band is delighted to announce the appointment of legendary composer Bruce Broughton to the new position of International Creative Chair. MD Professor Nicholas Childs commented, "This is a tremendously exciting appointment for the band as we continue to consolidate our creative team and develop new concert repertoire. Bruce Broughton is one of the most respected composers of concert and media music and work has already commenced on a series of projects in which he will take a leading role." Black Dyke's Creative Chair Peter Graham added, "I have been an admirer of Bruce's music for many years and his appointment is a real coup for Black Dyke. His is a rare talent—incredible versatility and a mastery of orchestration (which includes being familiar with the brass band medium as a former player). We have already had our first creative team meeting in London and his ideas for expanding the brass band sound are very exciting." Los Angeles-based Broughton is a multiple Emmy Award winning composer and double Academy Award Nominee. His credits range from iconic TV shows including Hawaii Five-O, Dallas and Steven Spielberg's Tiny Toon Adventures through movies Silverado, Young Sherlock Holmes and Michael Jackson's Moonwalker. Recent performances of his concert music include Fanfares, Marches, Hymns and Finale in Symphony Hall Chicago by the Chicago Symphony Brass, and a recent CD release by Gloria Cheng of Five Pieces for Piano. Commenting his appointment, Bruce Broughton said "To be associated with the Black Dyke Band in this new position is flattering, exciting and humbling. I have admired this very musically expressive and highly virtuosic ensemble for many years and am truly looking forward to an exciting and creative partnership with Nick, Peter and the band." Anyone familiar with Bruce Broughton's concert works will recognize two of the three works to be performed: "Tyvek Wood," a trio for flute, viola and harp; and "Toccata" for two harps and mallet percussion. The third, however, has been commissioned for this concert and will be enjoying its world premiere. "Dancing for Love, Dancing for the Gods" is a harp quartet inspired by a disparaging remark made by the legendary and often controversial American dancer, Isadora Duncan, about the dancers at the Paris Opera in 1900: "They do not dance for love. They do not dance for the Gods." For the complete program notes, click here. On Saturday, January 10, 2015, Hollywood Scoring brought together 100 young performers, interested in playing in the studios, for a three-hour "Future Session Players Clinic" at Sony Studios. The orchestra was conducted by Bruce Broughton and recorded by veteran recording engineer, Dennis Sands. Film music cues were provided by the JoAnne Kane Music Services Library. Broughton rehearsed the orchestra in film cues by Alan Sylvestri, James Horner, James Newton Howard, Jerry Goldsmith, John Powell and others, and then recorded the cues in order to demonstrate and experience the process and techniques of recording music for motion pictures. The event was sponsored by Hollywood Scoring and successfully produced by Michael Barry, Michael Patti and Noah Gladstone. View the gallery in Facebook. Considered the best brass in the world, the Chicago Symphony Orchestra Brass performed a powerful program to a packed audience on December 18th that ranged from traditional favorites to masterworks, like Bruce Broughton's "Fanfares, Marches, Hymns & Finale," arranged for the brass ensemble. The piece was conducted by Michael Mulcahy, and was part of the Midwest Clinic, which is is held annually and is recognized as the world's largest instrumental music education conference. Bruce Broughton takes a bow to a standing ovation with the Chicago Symphony Orchestra Brass at Symphony Hall in Chicago. "It's going to be a wowee-zowee time at the Bowl!" exclaims Bruce Broughton of this weekend's (Aug. 29 & 30) Hollywood Bowl spectacular saluting the music of movies. Expect Maestro John Williams and orchestra, a massive choir, a children's choir, and the talented and versatile Seth MacFarlane singing a special arrangement of "Luck Be a Lady" by the talented and versatile Bruce Broughton. Tickets are still available through Ticketmaster. For more information about the venue, please visit the Hollywood Bowl website. Hooray for Hollywood! is the theme of Saturday's concert in the picturesque setting of the LA County Arboretum, where there'll be plenty of stars to see from stage to sky. Familiar favorites, from song to symphony, will be performed by famed vocalists and composers along with the Pasadena POPS, among them special guest Bruce Broughton, who will be conducting his award-winning music from Silverado. For a complete list of performers, a download of the program, and ticket purchases, please visit the host website. Bruce Broughton will be back at Creature Features in Burbank, August 16, 1pm–3pm, signing copies of his most popular and beloved soundtracks—Tombstone, Harry and the Hendersons, Silverado and The Monster Squad—and the newest Intrada release, a 4-CD set that includes the Broughton classic, Buck Rogers in the 25th Century, which will also be available for purchase. Bruce Broughton will be at Creature Features in Burbank, April 5, 1pm–3pm, signing copies of his most popular and beloved soundtracks, including Tombstone, Harry and the Hendersons, Silverado, The Monster Squad, and a new Intrada release of Young Sherlock Holmes, which will also be available for purchase. This Intrada release of Young Sherlock Holmes is worthy of the most discerning of collectors, who will not only appreciate the stunning sound quality, but the original tracks in their full length, with Bruce Broughton conducting the Sinfonia of London. Thanks to the collective courtesy of Paramount Pictures, Geffen Records and UMG, Intrada was granted access to the original 2" 24-track scoring session masters, from which this 2-CD set has been remastered, and features the entire 90-minute work along with several "extras" that fans of Bruce Broughton and the film itself will enjoy and appreciate. The set is available for purchase through the Intrada website and select retail outlets while supplies last. A surprising pick, given the obscurity of this little-known, Christian Indie film, Alone Yet Not Alone, the song of the same title is an authentic hymn in every sense, deftly composed by Broughton for Joni Eareckson Tada's raw and unapologetic vocals and Dennis Spiegel's lyrics that speak directly to the heart of the story. Seemingly simple, as hymns are so characterized, the music carries the humble weight on its shoulders of doing exactly what it's supposed to do: stir the spirit and calm the soul. In this real-life ordeal that takes place in 1755 amidst the struggle of the colonies to survive the opposing European power and hostile native tribes, two sisters are captured and then separated, testing their faith to its farthest reaches. "Alone Yet Not Alone" is the hymn that holds their resolve and family strong, helping to guide their life-defining decisions and actions through their most perilous times. While Bruce Broughton is most known for his robust film scores (Silverado, Lost in Space, Tombstone), he reminds us ever so gently that less isn't just more, it's all there need be. Alone Yet Not Alone, which has been screened in limited release in 2013, is scheduled for general theatrical release in March, 2014. Kent Eshelman, professor of tuba and euphonium at Baylor University, has recorded Bruce Broughton's latest piece for tuba, Turbulence. The CD, entitled Flavors, also features the first recorded performance of Broughton's popular trumpet piece Oliver's Birthday in an arrangement made by the composer for tuba. Kent recently premiered the version of Turbulence for symphonic winds and tuba at the South Central Regional Tuba- Euphonium Conference at Louisiana State with the LSU Wind Ensemble. Flavors is available on Equilibrium Records distributed by Albany and online by The Orchard/IODA. Turbulence was commissioned by Kent Eshelman and Baylor University and is published by Brubel Music. Oliver's Birthday for tuba and piano is available through Black Squirrel Music. Part 1 of a special two-part radio show devoted to Bruce Broughton, with the man himself as co-host, is now online at cinematicsound.net. Tim Burden chats with Mr. Broughton about his beginnings, journeying through his vast repertoire, right up to his concert works and association with Hollywood in Vienna. Don't miss it! Bruce Broughton contributed the musical score to artist Mathias Poledna's animated film Imitation of Life, the Austrian entry at the 2013 Venice Biennale. The work of 155 artists and special exhibits from 88 countries are included, drawing inspiration from the model of a utopian dream by Marino Auriti who filed a design with the U.S. Patent office in 1955, depicting his Palazzo Enciclopedico (The Encyclopedic Palace), an imaginary museum that was meant to house all worldly knowledge. Auriti planned the model of a 136-story building to be built in Washington, one that would stand 700 meters tall and take up over 16 blocks. Curator Massimiliano Gioni says, " Blurring the line between professional artists and amateurs, outsiders and insiders, the exhibition takes an anthropological approach to the study of images, focusing in particular on the realms of the imaginary and the functions of the imagination. What room is left for internal images—for dreams, hallucinations and visions—fin an era besieged by external ones? And what is the point of creating an image of the world when the world itself has become increasingly like an image?" "Il Palazzo Enciclopedico (The Encyclopedic Palace) is a show about obsessions and about the transformative power of the imagination..."
The 55th Venice Biennale opens on Saturday, June 1st, and will run six months, closing on the 24th of November, 2013. CHRONICLING THE MAKING OF BRUCE BROUGHTON'S "TRIPTYCH FOR VIOLIN AND ORCHESTRA"
"IN THE WORLD OF SPIRITS"
Amazon and iTunes have set October 2nd as the release date for Bruce Broughton's "In the World of Spirits" on a new CD, also entitled "In the World of Spirits," recorded by the Emory Symphonic Winds, conducted by Dr. Scott A. Stewart. The CD features additional works for winds by Jennifer Higdon, Gustav Holst, Leroy Anderson and others. Planned originally as a Christmas album, the CD includes Holiday favorites such as "Greensleeves, Sleigh Ride" and a "Symphonic Prelude on Adeste Fideles." "In the World of Spirits," commissioned by the Emory Symphonic Winds, was inspired by, but does not directly reference, the energy, power and terror that inhabited the native American magical world of spirit. Hard copies will be available starting October 26th. Premieres: The recording, on Cambria Master Recordings (Cambria CD-1204; distributed by Naxos) features Canadian violinist Conrad Chow and premiere recordings of music by Bruce Broughton – the renowned Oscar Nominee, Emmy Award-winning L.A. film composer – and works by Canadian composers Ronald Royer and Kevin Lau, performed by Conrad Chow and the celebrated Sinfonia Toronto, conducted by Ronald Royer. "Premieres" also includes a bonus track, featuring Conrad Chow and Bruce Broughton (playing piano), delivering Chopin's Nocturne in C# Minor. The focus of this CD centers on the concept of the Premiere: the first showing of, or introduction to, something new. While new, each piece is inspired by earlier musical styles: Bruce Broughton's Concerto for Violin and Chamber Orchestra, Triptych evokes elements of the Baroque, 20th-century Prokofiev, and Celtic fiddle music of Scotland; his Gold Rush Songs are based on traditional American folksongs. The making of Bruce Broughton's Triptych was captured by well-known Canadian filmmaker Saul Pincus. The concerti were recorded July 4–6, 2011, at Revolution Recording (Toronto) by Jeff Wolpert. The violin and piano pieces were recorded October 14, 2011, at Firehouse Recording Studios (Pasadena, CA) by Ed Woolley. The CD is available on Amazon.com and iTunes. In the World of Spirits, commissioned by the Emory University Wind Ensemble in 2011 by Bruce Broughton, has been published and is now available for sale and performance by Brubel Music. The nine-minute work is a depiction of the energy in the world of the spirit: the world of motion, action, feeling, terror and excitement; the engine that drives the physical world and in which all things move and live. Listen to the performance by Dr. Scott A. Stewart and the Emory Wind Ensemble. Inquiries regarding a perusal score or purchase of score and parts can be made by writing to brubelmusic@brucebroughton.com. Bruce Broughton will be conducting a master class in film scoring this summer from June 15th through June 21st at the Piteå Sommarakademi (Piteå Summer Academy) in Piteå, Sweden, located approximately 500 miles north of Stockholm. For the first time, the annual Festival in Piteå (Festpelen i Piteå), of which the Summer Academy is a part, will be including a practical course in scoring for films that will include a week of film music studies presented by Broughton. The complete course will span five weeks and will include a recording to film by live musicians. The Festpelen i Piteå is an annual event held since 1982, and is a summer destination for many pop, jazz and classical artists and ensembles. Further information about the festival can be found at www.festspelen.se/pitea-sommarakademi. On April 20, 2011, the Emory University Wind Ensemble, conducted by Scott Stewart, will premiere Bruce Broughton's In the World of Spirits, as a part of the "Festival of New Music for Winds and Percussion." Broughton, who will attend the premiere, will also be honored with a performance of his American Hero, composed as a tribute to General Robert L. Scott, the author of God Is My Co-Pilot, as well as the finale from his Concerto for Piccolo and Wind Ensemble, performed by Carl Hall, Atlanta Symphony Orchestra's principal piccoloist. In the World of Spirits was commissioned by Dr. Stewart and the Emory University Wind Ensemble in 2010, and, although not specifically referential, was inspired by the vivid and powerfully dramatic spirit world of the Plains Indians, specifically the Comanche. Fans of Bruce Broughton's music for brass will certainly want to get Sound the Bells! the latest CD release from The Bay Brass, which features Broughton's Fanfares, Marches, Hymns & Finale. ClassicsToday.com described the piece as "a substantial (20 minutes) and captivating composition that happily expresses itself within the realm of conventional brass ensemble customs and language—no gimmicks, no weird experiments, no gratuitous sound effects—while maintaining an original voice through the composer's clever treatment of his thematic ideas." The long-awaited CD also includes previously unreleased works of John Williams, Michael Tilson Thomas, Morten Lauridsen (including the composer's brass transcription of his O Magnum Mysterium ), Scott Hiltzik and Kevin Puts. The album was recorded by Shawn Murphy at the Skywalker Ranch and is being released on the Harmonia Mundi label on March 8th, Broughton's birthday. The Super Audio CD features 5.1 Surround Sound, but also plays on regular CD players. The CD is available for pre-order on Amazon.com. Described by the American Record Guide as "a truly wonderful brass ensemble with a full-bodied sound and no rough edges," The Bay Brass, founded in 1995, is composed of brass players from the San Francisco Bay Area's leading performing organizations, including the San Francisco Symphony, the San Francisco Ballet and the San Francisco Opera Orchestras. On March 27, 2011 at 7 PM, The Bay Brass will celebrate the album's release with a performance at the San Francisco Conservatory of Music that will include music from the album. The concert will feature Broughton's Fanfares, Marches, Hymns & Finale, with the composer conducting. For further details, visit The Bay Brass website. INTRADA ANNOUNCES PREMIERE SIGNATURE RELEASE OF BRUCE BROUGHTON'S "GLORY & HONOR"
The challenge of scoring the story of American Navy commander Robert Peary's quest to discover the North Pole along with his trusted valet, Matthew Henson, an African American whose contribution has long been dismissed, could not have been handled more eloquently by Bruce Broughton, who brings to life themes of heroism and icy perils through sonorous brass, while the undercurrents of family and relationships are woven with woodwinds and strings. Inuit influences can be heard throughout, while the occasional emergence of turn-of-the-century allusions, such as ragtime, add a pointed sense of relevance. Broughton's complete score can now be purchased on CD, which has been mastered from the original session masters. For track listing, to hear audio samples from the CD, or to purchase, please visit the the Intrada website. This premiere, Signature Edition release is limited to 1200! An inside look at the NYU/ASCAP Foundation Film Scoring Workshop. When David Griffin was asked what prompted him to make this recording, he replied, "The primary reason for making it was to record the Broughton Sonata. It's a wonderful addition to the horn repertoire and deserves to be better known." David Griffin's CD, "For You," can be purchased online at CD Baby. 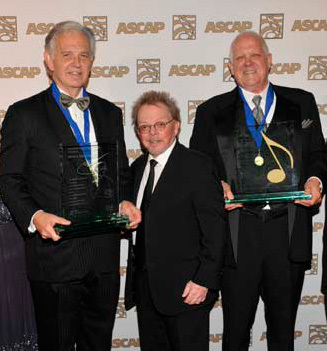 (Left to right) ASCAP Henry Mancini Award honoree Bruce Broughton, ASCAP President and Chairman Paul Williams, and ASCAP Golden Note Award Honoree Dennis McCarthy. BEVERLY HILLS, Calif.—Veteran composers Bruce Broughton and Dennis McCarthy took top honors at Thursday night's 25th annual film and television music awards of the American Society of Composers, Authors and Publishers (ASCAP) at the Beverly Hilton Hotel. Approximately 600 attended the black-tie event. At this year's ASCAP Film and Television Music Awards, Bruce Broughton will be presented with the distinguished ASCAP Henry Mancini Award in recognition of his outstanding achievements and contributions to the world of film and television music. Said ASCAP President and Chairman Paul Williams, "As we celebrate the 25th anniversary of our Film & Television Music Awards, we are especially proud to spotlight the achievements of Bruce Broughton.... Bruce's sterling compositions are featured in a stunning variety of media, and he brings a tireless spirit to his work as both a teacher and an ASCAP Board member. It's especially gratifying to give the prestigious Henry Mancini Award to a creator whose success is matched by such selfless commitment to education and service." Previous recipients have included Carter Burwell, John Debney, Mark Isham, Quincy Jones, Michel Legrand, Randy Newman, James Newton Howard, Johnny Mandel, Marc Shaiman, Howard Shore, Alan Silvestri, and Hans Zimmer. The 25th annual ASCAP Film and Television Music Awards take place June 24, 2010, at the Beverly Hilton Hotel in Los Angeles, California. Bruce Broughton's popular Tuba Concerto is receiving its Oregon premiere May 28 & 30 by the North Oregon Coast Symphony conducted by Collin Heade. The tuba soloist is Dennis Hale. "As the lights went down in the Samuel Goldwyn Theater this past Friday night, the curtain rose to reveal Leopold Stokowski taking the conductor's stand in Fantasia. But the first notes of the evening were not from that 1940 classic feature. But — rather — from the tinny, half-destroyed instruments that Goofy and the gang played in that Mickey Mouse favorite, "The Symphony Hour." Bruce Broughton turns 65 today. But don't speak about retirement to the Oscar- and Grammy-nominated, multi-Emmy-winning composer. He seems to be busier than ever, with projects in multiple arenas of music-making – from concert-hall commissions to high-profile animation projects to theme-park rides – and he remains a leader in the Hollywood music community, currently serving both as a governor in the Academy of Motion Picture Arts & Sciences and on the board of directors of ASCAP. Classical Hollywood film scoring is the focus of the NYU/ASCAP Foundation Film Scoring Workshop that continues to be taught by some of the industry's most creative and prolific composers and orchestrators. This year's exceptional faculty includes the distinguished "Silverado" composer and ASCAP Board Member, Bruce Broughton, who is currently inspiring USC students at the Thornton School of Music. Workshop sessions will concentrate on the creative process, orchestrating, conducting, and MIDI mockups, culminating in a full day of recording sessions with some of New York City's top-tier studio musicians. (Previous workshops included members of the NY Philharmonic and The Metropolitan Opera Orchestra). The business side of film music will also be addressed. The Workshop runs from May 18–27, 2010. The deadline for applicants is April 1, 2010. For more details and specifics, please visit http://steinhardt.nyu.edu/music/scoring/ascap. Beginning in July, Bruce Broughton will be conducting a workshop in the art of Hollywood Music at the Albrecht Berger Music School in Vienna, Austria. The workshop offers a week-long course in the creation and production of music for film, television and video games. Broughton was a recent guest of "Hollywood in Vienna," a celebratory concert of symphonic film music in which he coducted excerpts from hs score to "Silverado."